Wonderful ! I know I'm quite slow to give the answers because I don't have much time to sit and transcribe, so your comment makes me feel better about it : maybe not that slow after all I'll be happy to hear from you. Mie030, no problem, of course ! I add "Halo" to the list. Kalika1988 wrote: would it look or sound better if my phrase would be translated or not? 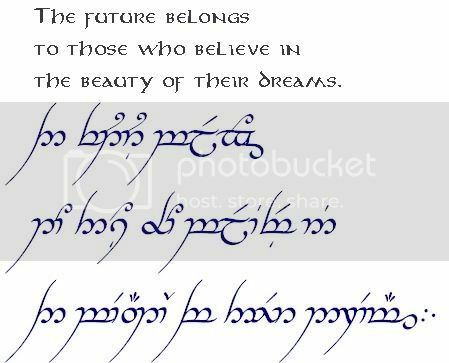 Well, this is a very personnal choice... in fact, even if you stay in English, the result will look very elvish because of the writing and probably nobody around you is gonna be able to read it. 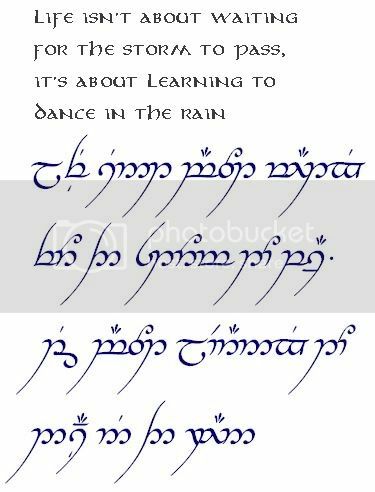 So you have to choose if you want to have and Elvish (Quenya or Sindarin) sentence in elvish written or an English sentence written in Elvish. Does Quenya or Sindarin mean something for you ? If yes, then I suggest you opt for a translated sentence, because anyway you're the only one who's gonna know what is really written. If not really, I don't see a reason to do it when you have the possibility to transcribe your original sentence, the one who means something for you. That's what I can say, trying not to let interfere my personnal preferences, because like I said it's a too personnal choice. "Listen to your heart" ! Just tell me what you decide. lauza wrote: Hi there. I hope there are people still currently willing to do some Tengwar for me. lauza wrote: I've just had a translation done for in the Quenya thread for "find beauty". I'm sorry Isildilme. I didn't realise you had replied to me. 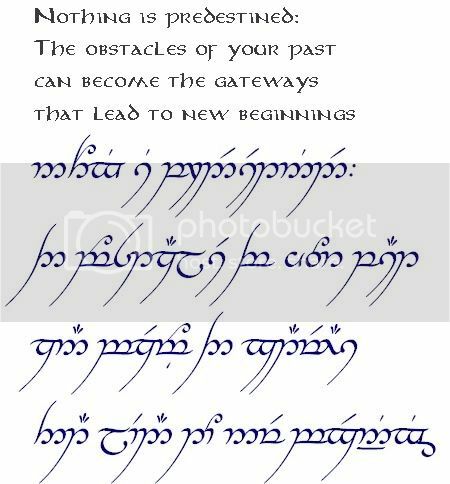 Yes just the Quenya transcription into Tengwar would be lovely. Thankyou. Okay, I will stick to English then..thanks for the help and reply..
Find a boy who calls you beautiful instead of hot. who stays awake just to watch you sleeping. and isn't afraid to tell his friends that you are his girl. Find a boy who keeps telling you how happy he is to be with you. Well, I will of course do this for you... but you'll maybe have to wait a little longuer because it's a quite long quote ! You're gonna have it all tattooed ?! Sounds like a quite big tattoo ! Hum, on that point I can't help you very much. It makes sens for me, it seems to be ok, but I'm afraid my English isn't better than yours ! If someone else want to comment if the text is ok in English, than express yourselves ! I'll transcribe it after that. Dude, it looks awesome. thanks a lot! the text got corrected about 2 or 3 times from different persons, so i think its all right in it. i'll be happy to get my translation =) thanks forward. 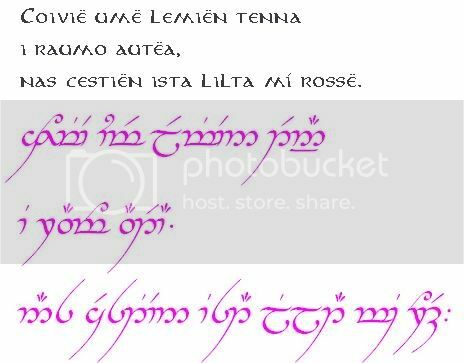 How long will it take to translate the text into tengwar? Love is my guiding light. Alis grave nil. - that's latin for "Nothing is hard to those who have wings." 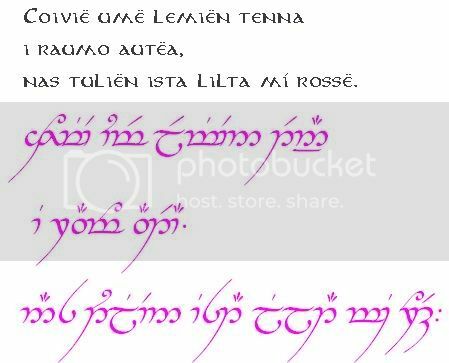 nicci1991 wrote: How long will it take to translate the text into tengwar? In fact, the transcription by itself won't be very long : as soon as I have a free moment, I'll transcribe all the pending requests. What is longuer is to write them on my computer, transfer as an image and download them on the site. I have to be at home to do that, and that's why there are more delays. I think you should have it next week (before Sunday 11th). Sach, no problem. The only thing is that I don't know about a transcription mode for Latin, so if you don't mind I'll transcribe the phrase as if it was in English, unless you have a mode to suggest. Don't worry about your English ! Like I always say, mine is even worst. Hopefully nobody is complainig about it, maybe due to the fact that I'm here to help ! I'v been going though this thread to see if I could find transcriptions of the names you are working on for me to try saving you some time. In one of your comments you said there is no X in tengwar. how we going to work that 1 out?? Whilst searching I thought I'd look for transcriptions of some of the words that new people are looking for, as a small thank you to you for your time. So here are my thoughts to all the newbies like me. To save a load of time you could look through the comments of the previous transcribers(list below) and if you find the word, name or phrase you want you could always get Isildilmë to look at it and let you know if its correct. There really are loads to choose from. Chellan, thanks for sharing this idea with everybody : it happens a lot of times that someone ask for a word/name that as already been answered by somebody on this thread. And about X letter, don't worry, there's no problem ! As you can see in my explanation, in Tengwar, the X doesn't exist by itself, but is replaced by the combination "KS", so Xander will be written Ksander litterally. By the way, I think I should be able to post a few transcription for tomorrow. i understand where your coming from, ive fully convinced now, between two! i want to have the tattoo full length on my forearm. There really is double and triple transcriptions on. Its double the work for you i suppose. You're lucky, I finally had a little bit of free time right now ! As I had already prepared “My princess” for you, I did “my eternal princess” right now (not much longer !). To have it in several sizes, I suggest you email me (it’s not a good idea to post big pictures here). I’ll send it back to you by email. And concerning your question about our opinion… well… I admit it is a difficult and important decision, but overall it’s a personnal decision ! If you ask me, of course I prefer the Quenya version, because I’m in love with this language, but it may not be your case. Think about what means the most for you. I’m sorry it may not be the answer you were waiting for… but that’s mine ! Edited by White Council Moderator to reduce page stretching. As you asked for, the first transcription (dark blue) is using English mode, the second (purple) is using the Spanish mode. If your native language is Spanish (or if your origins are latinos or Spanish), then I would suggest you use this version. Thankyou so much for my transcription Isildilmë. My babys names look so beautiful.. They look like the ones that I had hand drawn in Quenya style only My S was upside down and I had 3 dots above the X, is it tehta they are called?? Remember that 1 thing at a time ??? Thank you, You are an angel!!! Chellan, that's it, the symbols over the tengwar representing the vowels are called tehtar (singular : tehta). And when you put a tehta over a S, than it as to be upside down, so you weren't so far on that point. 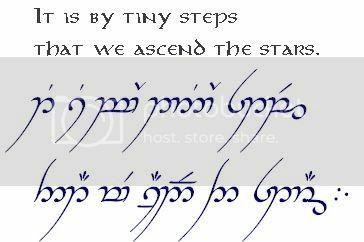 The only thing is that with the English transcription mode, the tehtar have to be carryed by the following tengwar, instead of the preceeding as in Quenya, for example. Hope this help you in the future. And for the one thing at a time, you can grab the image directly on the post and save it in your computer, or I can send it to you by e-mail (I'm gonna do this, so it may help you). Isildilmë, thank you very very much. I hadn't expected such a quick reply . All three versions look beautiful.. it will be hard to decide which one to get. I'll be happy to see them, even if it takes a long time ! thank you agin for your time and hard work! So I'll have my work cut out lol. Any idea which rule i follow in the Spanish mode with my tehtar? Hope you dont mind me asking loads of questions! tat kid your's looks BEAUTIFUL. Will make a very nice tattoo. I'm definitly gonna turn red ! And yes Chellann (sorry, I just realise you have 2 n in Chellann), there's a different mode for Spanish. I'll send you something on this subject, and I'll be happy to correct your work after you try to transcribe your next tattoos. If you want to do them with Word, than you can click on Insert Special caracters, and choose the good symbols (the letters on the keyboard don't correspond to the same sound in Tengwar automatically !). And don't worry about your questions, I'm always happy to meet people sharing a part of my madness ! I know what you mean. Its really difficult to get the grasp of, But one day it will just sink in without us even knowing it lol. Hopefully!